It's funny; as a kid I was a pretty good putter. In fact, I remember going to a summer hockey camp one year--it was 1967, Canada's Centennial year--where we were staying on a golf course. When not on the ice, which was my first love, we were playing golf, or putting for money on the putting green outside our rooms. As I recall, I came home with more spending money than I started with thanks to my putting. Somewhere along the line, however, two things happened that hurt my putting. First, I started becoming mechanical about my stroke and trying to imitate the putting styles of the top players. Then, I learned how damned easy it was to miss a three-footer. Since then, I've had some stretches of really good putting; but I've never been as confident on the greens as I was as an eleven year old who wasn't worried about missing. "Up until 1921, my putting was about as bad as one could imagine; I had experimented with it for years, but most of my experiments had taken the form of attempted imitations of some of the good putters I had seen, notable among whom were Walter Travis and Walter Hagen. I had studied the styles of these men, particularly that of Hagen, and would always try to assume the same posture at address, and attempt to swing the putter in the same way. The result of these efforts--and it was a result that should have been expected--was a tension throughout my whole body that would not otherwise have been present, so that however accurately I might reproduce the stroke that had been successful for the man I was imitating, the effect if it was destroyed because I could never relax. After all these experiences, I determined to putt naturally." "The putting stroke is the simplest of all because it is the shortest; once a person has developed a fairly good sense of what it is all about, and once he has developed a rhythmic stroke that can be counted upon to strike the ball truly, the only thing he should worry about is knocking the ball into the hole." "Anyone who hopes to reduce putting--or any other department of the game of golf for that matter--to an exact science, is in for a serious disappointment, and will only suffer from the attempt. It is wholly a matter of touch, the ability to gauge a slope accurately, and most important of all, the ability to concentrate on the problem at hand, that of getting the ball in the hole and nothing more. 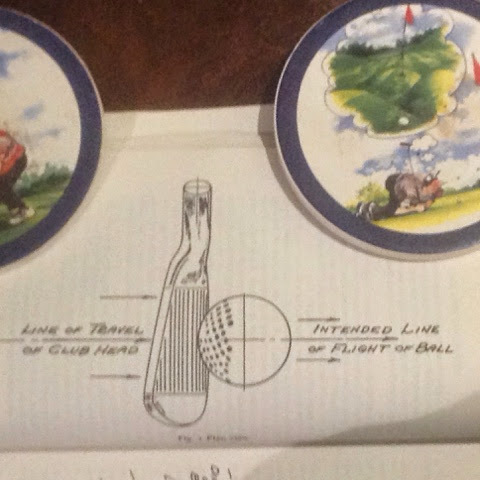 I think more potentially good putters have been ruined by attempting to duplicate another method than by any other single factor; by the time they can place themselves in a position they think resembles the attitude of the other man, they find themselves so cramped and strained that a smooth, rhythmic stroke is impossible." 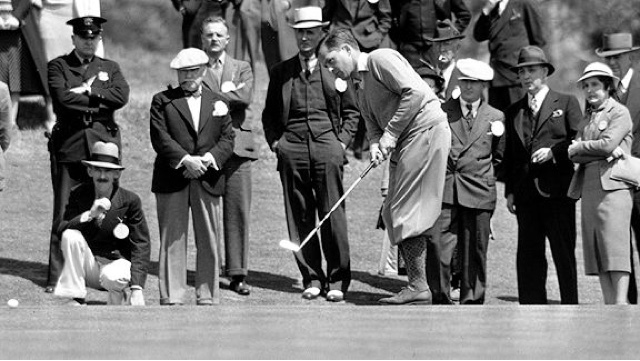 Bobby Jones was ever the pragmatist. He knew that putting, like the rest of the game, was all about striking the ball so that it would comply with your wishes--in this case by rolling into the hole. All the pains taken to stand, or swing, in any specified way were often only helpful in terms of adding tension and possibly taking your mind off the problem at hand; namely striking the ball just so. I love his teaching.